Getting the itch to move! As of June 27th we have been sitting in one spot, here in Spokane, for 4 weeks. We will not roll the tires again until next Thursday, the day after the 4th of July. This past week we have been just enjoying being by ourselves again as our hosts, my sister and her family, have been gone to Jackson Hole for a week's vacation. We have both been doing a lot of reading, sitting on the main deck enjoying the long view across the valley, eating lunch out a few times, meeting old friends from our college days who live locally, putting the top down on the T-Bird and taking drives to no where in particular, doing some insurance work, shopping at the local Goodwill (we got some great buys! ), watching the Euro Cup soccer tournament in Europe, with the final this Sunday, and for me some mountain biking on the trail behind the house. That pretty much sums up the last 7 days. Nothing spectacular, but supremely rewarding, and enjoyable. We are getting the itch to move on, in fact I have had the itch for a week now. I've been reorganizing the trailer, and have removed a number of items from both the trailer, and our basement storage areas that we have not pulled out to use ONE time on our journey, so I say, what is the point of hauling these items around and further? In addition, we will probably leave our recumbent tadpole trikes here at my sister's home until we return next summer, as I do not foresee us using them much in the next 12 months. Why, you ask? Well, we will be in the eastern half of the US from October until we cross back over the Continental Divide about this time next summer. There really just are not many places in the east with long bike paths. Elaine prefers to ride the trikes on bike paths separated from the roads, and highways. So, at any rate, we will have a little extra weight (about 300 lbs), and more room to store the things we do use on a regular basis. I have moved some things from the trailer to the basement storage area of the coach, making the trailer a little less congested. In addition, Elaine has reorganized, again, the interior storage areas, and created more space. 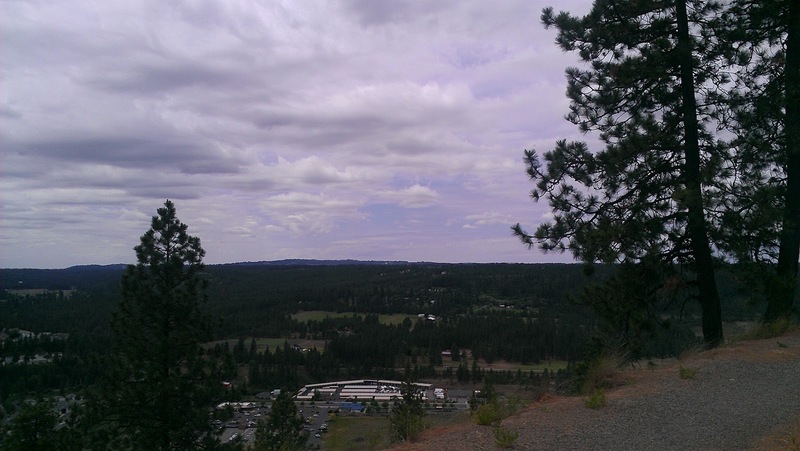 The weather here in Spokane has begun to warm up, and with the lone exception of this past Tuesday when it rained all day, the temps have been in the mid to high 70's. Nevertheless, we are heading to Coupeville on Whidbey Island next week where the weather is still in the 50's and 60's, which will not hurt my feelings.....lol! As we see reports from around the country of triple digit record setting temperatures we are grateful to be here in the Pacific Northwest where the weather is exactly what I expected when we decided to spend a large part of the summer here. Tomorrow will mark the end of our 5th month on the road......yea!!!!! Between now and October 1st when we set in for our two months at Amazon in Campbellsville, KY we will be on the move a lot, adding over 2500 miles to our odometer reading, and new adventures......we will be exploring the Olympic Peninsula, the Oregon Coast, traveling across Nevada, Utah, Colorado, Kansas, Arkansas, etc. on our way back to Kentucky. We have enjoyed our month plus in Spokane, but really are looking forward to moving again, and changing our view every few days. We have wanted to ride the western end of the Centennial Trail from downtown Spokane ever since we arrived in Spokane 3 weeks ago......has it really been 3 weeks? Finally, on Tuesday we got our act together and headed downtown in my brother-in-law's Toyota Landcruiser with our bikes mounted on our recently reassembled bike rack. We've ridden from the house down to the downtown Riverfront area twice now, so we saw no point in covering the same ground again. The ride from downtown to 9 Mile Falls is about 13.5 miles which translates into a total of 27 miles. The day started cool, and breezy, and remained that way the entire ride out and back. I wore a short sleeve shirt which was just barely adequate for parts of the ride when we were hit by strong, COLD breezes, but not cold enough to put on something warmer, which I did have. Elaine was bundled up for most of the ride. The paved asphalt trail alternately climbs up well above the Spokane River, and then descends rapidly to the banks of the river.....over, and over.....up and down, up and down.....some of the grades exceeded 10% for short stretches, but we both handled the climbs well, and enjoyed hurtling downhill, and along the shores of the river. The trail alternated between a dedicated bike path, and road riding on a lightly traveled road. Some of the bike path sections were obviously old railroad right of ways such as the section above, which still utilizes an old railroad bridge to span a section over water near the western end of the ride we took. The Centennial Trail continues on westward past 9 Mile Falls, but that is as far as we ventured on Tuesday. We stopped for about 30 minutes on our way back to eat some snacks and take in the view from one of the many benches provided along the way for just this purpose. In addition, there were numerous rustic restrooms (pit toilets) along the way, spaced out at convenient intervals along this section of the trail, and we were grateful more than once over the 4+ hours we did take advantage of on more than one occasion. Sometimes you just had to stop and take in the view. By the time we returned to the car, which we had parked in a Public Parking lot near the downtown area for $3 for the entire day, we were ready to be done. The last few climbs kind of wore us down, but it was a good day, and it felt good to be tired......a good tired. Wednesday we just hung out around the house. I washed the trailer again....I last washed it at my brother's home in South Jordan over a month ago, and it had been in the rain several times since then. I'll probably wash the coach again in the next couple of weeks as I just washed it a few weeks ago when we were in Coeur d'Alene for 5 days. Elaine took out the front curtains that pull across the front windshield for privacy to do some minor repairs, went shopping for some sewing supplies, and got out her sewing machine. In addition I took delivery on a Gary Fisher hybrid bike I bought on Ebay on my sister's behalf. They are having a birthday party for her pastor in a couple of weeks, and this will be one of his presents. He has expressed interest in getting back into bike riding. This will be a good bike for him. Even though slightly used it is in excellent condition, and only needs a little cleaning, which I'll do over the next week or so. Today, Thursday we anticipate heading up to Mt. Spokane with our bikes in tow to do some site seeing, and a little casual riding around the area. Beginning Saturday, June 16th, we have the house to ourselves for 2 weeks while my sister and her family are traveling hither and yon. 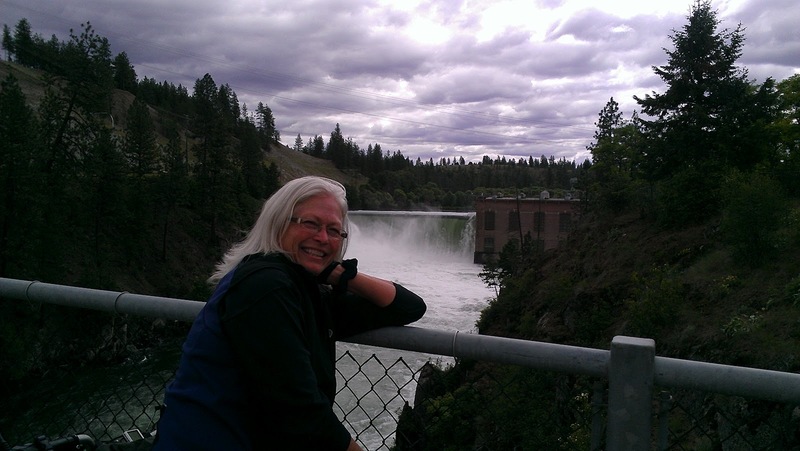 We decided to take our trikes over to the Fish Lake Trail which we had heard about through several sources. It appeared, from our research to be around 10.3 miles in length, and since we would be doing an "out and back" ride it would total around 21 miles for the ride. We arrived at the trail close to Noon, and were quickly on the trail......we took a break at about the 6 mile mark, thinking we still had 4+ miles to go. As it turned out, the trail ended after just 7.65 miles. There are plans to complete the trail all the way to Fish Lake, from which the trail derives its name, but right now it is not complete. I shot a short video of our ride on the trail so you can get a flavor of what the trail is like. The entire length of the trail we rode was nice asphalt. 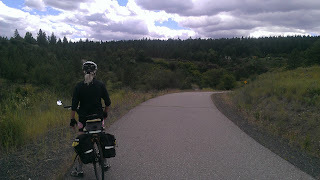 There are places where pine tree roots have caused some ripples in the asphalt, but, overall, it is a nice riding trail. Since this trail was built on an old railroad right of way the grade up to the lake never exceeds 3%, and in fact, much of the time it is under 2%. 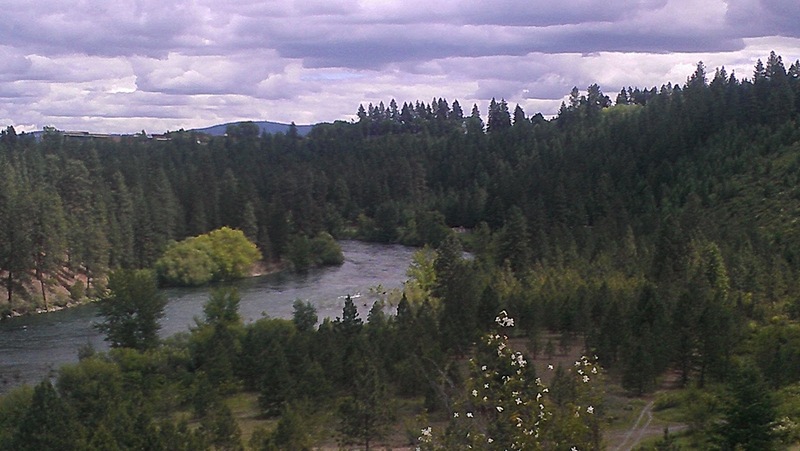 You are treated to views of the Latah Valley from time to time, and there is a lot of shade along the sections having pine trees lining each side of the trail. There are also several spots in the first few miles where there are benches where you can take a break and enjoy the view, or watch passing cyclists. On Saturday the trail had a lot of bike traffic, which is good to see. Since this was the U.S. Open Golf championship I spent part of the afternoon watching the hole by hole coverage. We are enjoying being alone again, with just each other for company. On Sunday Elaine needed to go shopping for groceries for the next week, and I decided to take on a project I had been putting off since we arrived in Spokane. 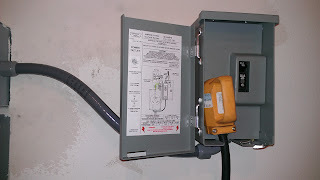 I had left a 30amp electrical RV outlet for my brother-in-law the last time we visited in October of 2011 to have installed, at my expense, by an electrician, however, he never got to it. 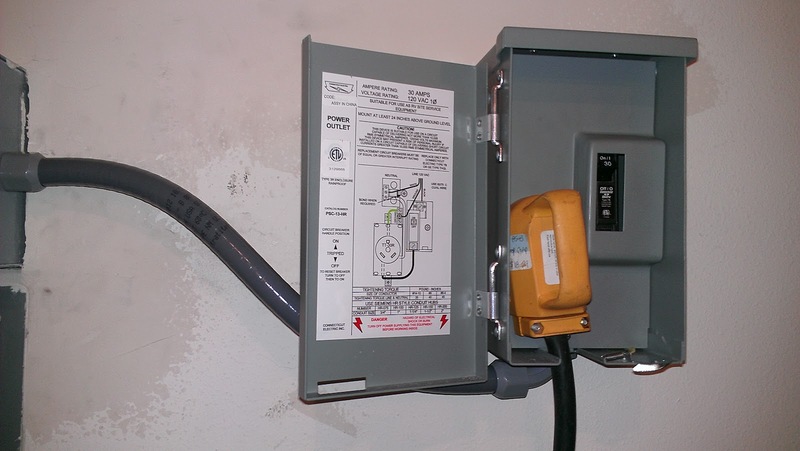 I decided I could probably do it, so I went down to Lowe's and got some 10 gauge wire, and within about an hour had it wired up, and, after confirming with my "polarity checker device" that it was, indeed, wired correctly, I plugged in the coach. Now we have 30amps of power, and that means on cold days I can run two electric heaters, or on hot days both A/C's if need be......I don't anticipate the latter being necessary for the remainder of our stay, but there have been days, like today (Monday) that I wished I could run both heaters.....it is down in the mid 40's as I write......brrrr! I finished my project just about the time the Lovely Elaine returned, and helped her take in some of the groceries, then cleaned up my mess, and got ready to watch the final round of the U.S. Open. Elaine actually joined for me for the entire afternoon until after 7pm, when the tournament finally ended with Web Simpson, an unlikely victor, coming in first at +1 (one over par) for 72 holes.....that is a first for her, and she seemed to really enjoy watching.....WOW, you just never know.....LOL! It was a nice quiet weekend......looks like today, Monday, will be a stay inside day....it has been raining on and off, and the temperatures on in the mid 40's! Every year around the middle of June the city of Coeur d'Alene, ID is host to one of America's biggest vintage car shows, which is called "Car" d'Alene. 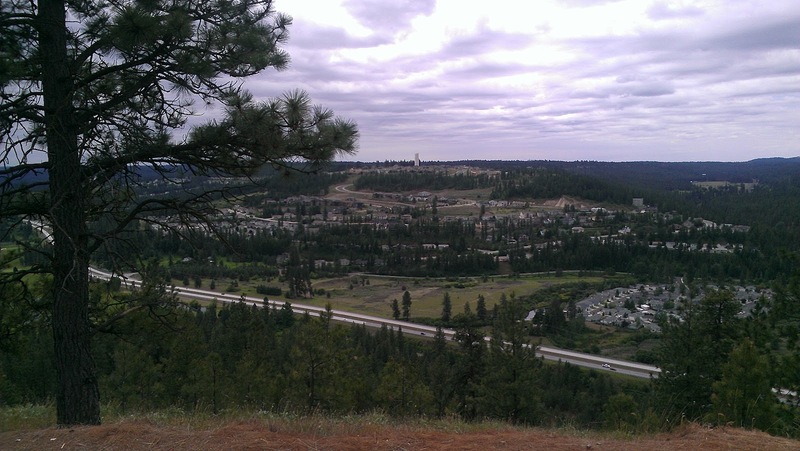 It is held near the Lake Coeur d'Alene Resort. This year the dates for the car show are June 15-16. Since we are only about 40 minutes away we decided to head into Coeur d'Alene Friday, June 15th, afternoon and spend the afternoon "oohing and awing" at the pre 1971 vehicles of all makes and models on display. A few days ago we took the top off the T-Bird, and decided that today was a good day to lower the rag top and enjoy the wind in our hair as we motored eastbound on I-90 over to the Idaho border. We exited I-90 at 4th Street and headed toward the Lake Resort area, and ended up parking in the city parking lot on the west side of the Resort complex.....this was a very fortuitous decision for later in the early evening when we decided to leave, as it was just outside the area the police had cordoned off for the parade of cars which would rumble east on Sherman. The parking in this city lot is not free, and there is a ticket machine you must either insert the EXACT change ($1.00 per hour), or a credit card to pay IN ADVANCE for your parking space. The problem was this machine's card reader was not functioning so people were scrambling to find EXACT CHANGE to pay for their parking. A process that should have taken 2-3 minutes per person took around 10 minutes per person due to the machine's extremely slow processing time. Ultimately we were able to exchange money for a parking ticket and were on our way walking to Sherman Street. The weather was balmy, and very sunny.....very few clouds, which we are finding is unusual for this area.....instead of referring to "rain showers" they talk about "sun showers" here. As we walked down Sherman it became obvious that we needed to find a sidewalk cafe to "camp out" at while we awaited the start of the parade....it was around 3pm, and the parade start time was sometime around 6pm. We found a perfect spot at Splash - Liquid Entertainment which had several tables outside with a perfect view of the parade venue. We ordered a pitcher of Mac and Jack's African Amber beer, and some Tempura Asparagus (yum, and yum! ), and settled in to wait for the parade. There was no shortage of cool vintage vehicles doing a pre-parade loop around the downtown area, and we got a few pictures. Around 6:15pm the parade began, and there were literally hundreds of cars driving down the parade route, and there was no end to the "OOHS AND AWS" reverberating up and down the parade route, not to mention a few "burnouts", and a few guys letting us hear how cool their exhaust systems sounded. Splash is also a sports bar, so they had the U.S. Open Gold Tournament on several of their large TV's. I walked back and forth from our table to the bar area a number of times to see who was on top of the leader board over the course of the afternoon. We hung around until around 7:30pm, and then decided to head "home", but not before stopping off to visit our Coeur d'Alene friends, George and Brenda, for about 30 minutes. That was our Friday, and a nice day it was, indeed! Wow! Has it been almost a week since I last updated this blog! Yep, no denying the obvious. Elaine and I have continued to ride our bikes most days, and on those days when Elaine wasn't interested I rode my mountain bike. I've ridden that trail behind the house 3 times now, and am really enjoying it. From the end of the cul-de-sac down to Hangman Valley Road is 2 miles. When I hit the road, I turn around and ride back to the top just behind my sister's home, but not all the way back to the cul-de-sac, then all the way back down to Hangman, then all the way back to the cul-de-sac....about 7.3 miles total, and a very good workout! 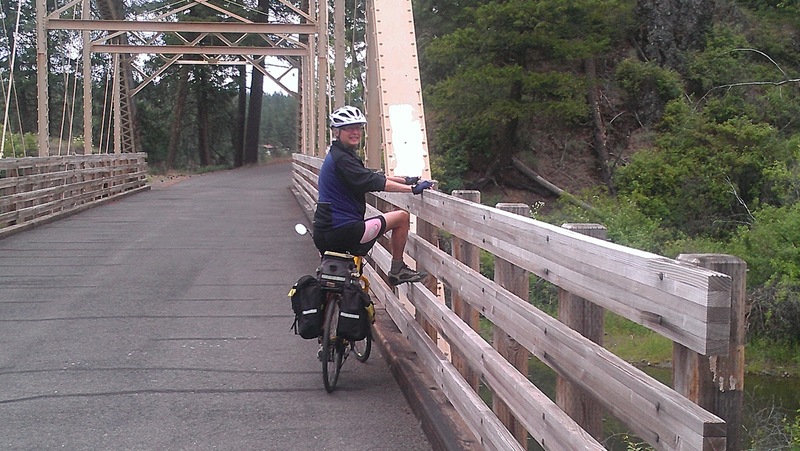 During the last week Elaine and I took out the tandem and rode a 15 mile loop down Hatch Road to Hangman Valley Road to Polouse HWY to 57th street, and back "home", as well as a couple of single rides. We went out to dinner at Picabu Bistro where we enjoyed their Angry Prawns (drenched with their famous Fire Sauce) and Fire Pasta (again drenched in that famous Fire Sauce). This is my second time to Picabu and enjoyed it just as much as the first time. That Fire Pasta has a unique sauce ("Fire Sauce"), ingredients unknown, of which you cannot get enough! Last night, Thursday, we went out for dinner again at Luna, another great local restaurant no more than 3 miles from "home". Bob and I had steaks, and the girls (Elaine, Hilary, and Hilary's daughters) had Creamy Leek Risoto. 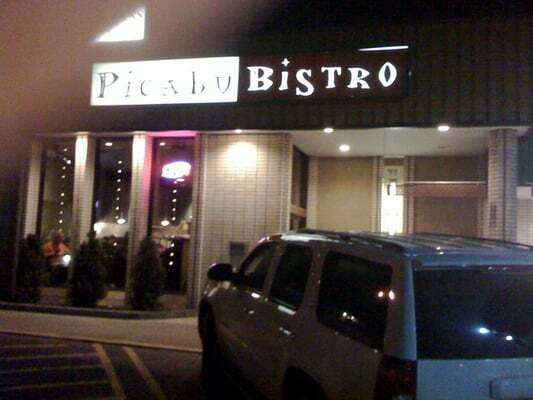 This restaurant is pricey, but the food is very good, and they have a great wine list. Yesterday Elaine and I took my mother, Virginia, to lunch at the MacKenzie River Pizza Company. They have a number of locations in the western U.S. The food was good, and they offer a number of local craft beers on tap. My sister left this morning for Boston with her oldest daughter, to visit a few colleges, and spend a few days at Nantucket, and then back to Wyoming to meet her husband and younger daughter at a "dude" ranch the visit most every summer. We will be babysitting their 3 King Charles Spaniels while they are gone. We will be riding several local trails during the next two weeks.....Centennial Trail, Fish Lake Trail, Hiawatha Trail, etc. The weather is beginning to warm up into the 70's.....lol! We have had rain on and off the last week, and a spectacular thunder/lightning storm a few nights ago. We are enjoying this down time, and continuing to work on small coach projects. Let's see, my last post was about Saturday, Sunday and Monday, so it must be time for Tuesday, Wednesday, Thursday and Friday.....wow, have that many days passed since I posted.....time is flyin'! Tuesday was all about my niece Caroline's promotion from 8th grade to 9th grade, or, in other words, High School! We had just been at St. Georges School the day before to watch "May Terms", and were back by 9:30am Tuesday for Caroline's promotion ceremony, which, considering there are only 80+ kids, it took almost two hours to present all the special awards, letters of recognition, etc., and then the vaunted promotion certificates. After the ceremony we headed off to the Flying Goat for lunch. What a cool little place....they have a lot of beer on tap, but considering the day (rainy, cold, blustery) it seemed like a day for some Guiness Stew and Guiness Beer, so that is what I had, thank you very much. Just after lunch my brother-in-law had to leave for the airport to catch a flight to Chicago for business. Wednesday was a rainy day on and off, so Elaine and I drove over to REI to do some shopping for some shoes for her. REI is a regional outdoors outfitter. REI stands for Recreational Equipment, Inc. We didn't find what she was looking for a reasonable price, but she did find a shoe that fit, so we will keep an eye out for that shoe at a better price, somewhere else. After REI we headed north to the local Ford dealership to buy a replacement brake lever boot for the T'Bird.....this piece is not well designed, and we have to replace it every couple of years.....the price has been rising steadily, and this time it cost over $90! I think the first time I replaced it the cost was $45 about 5 years ago. I am a mountain biker at heart, but probably do most of my riding on streets now with the Lovely Elaine, since that is what she prefers. My sister's home backs up to forest land and in that forest land is a great mountain bike trail. Finally on Friday I got my Intense 5.5 out in between rain storms and rode the trail for an hour, or so.....probably about 6 miles in all. I will be riding this trail more in the coming weeks....all I have to do is ride down to the end of the street and on to this trail. 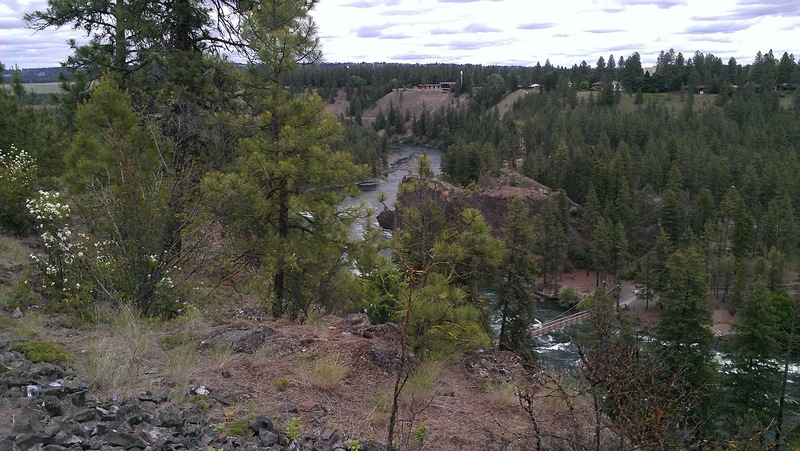 My pictures are a little out of order....this picture is of a portion of Gonzaga University, which lies along the Spokane River. On Thursday morning my sister, Hilary, suggested we (her husband, Bob, was in Chicago on business, so it was just the 3 of us) all ride down to Riverfront Park along the Spokane River and back.....Elaine and I had done it a few days before, and I knew it was about 17-18 miles round trip. I reminded Hilary of the distance, but she is one game lady, and didn't back down. The trip to Riverfront is mostly flat and downhill, so getting there was easy. Getting back would be the trick. The weather was slightly overcast, and in the 60's, so it was perfect riding weather. We left around 10am and rode along High Drive, which provides an amazing view of the valley to the west. 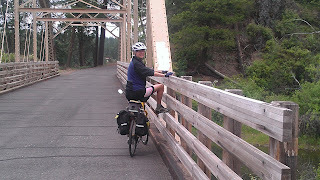 We rode up the west side of the River past the Civic Center, and then crossed over the bridge to Gonzaga, and then headed back down the river on the east side. On our way home, about half way up the long climb to South Hill I spied a Rocket Bakery at the intersection of Adams and 14th, so I suggested we take a break and have a cup of coffee, which we did, of course! We arrived back home around 1pm. Later that evening I watched, simultaneously, the Celtic/Heat game, and the Kings/Devils game.......the Celtics were beaten soundly, and single handedly, by LeBron James, and my Kings, also lost a close game. Friday evening Bob returned from Chicago, and my sister treated us to her award winning White Chili. It was a very laid back week with rain on and off coupled with very cool temperatures. 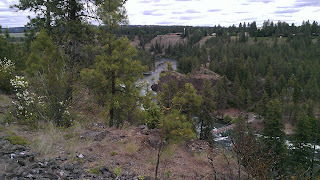 We are really enjoying out time here in Spokane, and getting to know the area. Next week we will do more bicycling, and more exploring. It's been a few days since I have posted a blog entry. Not too much has been happening. We have taken several bike rides, and hikes, and have just been enjoying the feel of a city that feels more like National Forest than city. Next to my computer is a brochure we were given at the Visitor's Center in downtown Spokane. Just below the title "SPOKANE" are the words "NEAR NATURE. NEAR PERFECT". That is a catchy motto, and I think it fits Spokane. You are never far from Nature in Spokane, even in downtown. The picture above was taken a couple of days ago on one of several bridges that span the Spokane River in the downtown area. 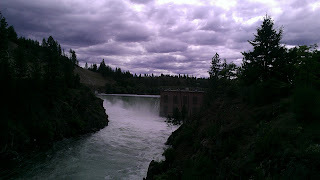 In the background are Spokane Falls, and at this time of year with the snow melt still filling the river to it's banks it is quite an example of Mother Nature at her most powerful. You can feel the power of the millions of gallons of water tearing at the large rock formations along this stretch, and at the man made structures themselves. On Saturday I picked up my mother, Virginia, and took her to lunch at the Rockwood Bakery over on 18th street about 1/2 block from Manito Park. A little pricey, but I really like the ambiance, and the coffee was good, too! It was great to just sit and talk about cabbages and kings for a couple of hours with my Mom. On Sunday morning we rode our road bikes down to Riverfront Park, and down to the falls area before checking out the Visitor's Center. At the Visitor's Center we got good advice (along with a downtown map) on a good bike route back to South Hill. All in all we did about 17 miles of riding....a lot of uphill on the way back to South Hill, then later in the afternoon we took a hike on a trail that begins at the end of the block and winds about 3-4 miles through the forest. On Monday we attended a year end event at St. Georges School, which our nieces attend, called May Term. The high school kids choose an activity they will participate in from film making to dance to Public Service (volunteer work), and then gave a presentation at May Terms on their experience. It was quite enjoyable. Later in the day my brother-in-law and I watched Tiger complete a rare come from behind victory in the Memorial Golf Tournament birdying 3 of the last 4 holes to win by 2 strokes. Whether, or not you like Tiger, no one can dispute that when he is competing at a high level it is good for the PGA. After that we watched the Celtics win a cliffhanger in overtime against the Heat. On top of that the L.A. Kings won game three of the Stanley Cup Finals over the N.J. Devils last night to go up 3-0 in a best 4 out of 7 series. All in all a great three days of sports! My brother-in-law has a great inventory of local bottled craft beer, and I have been doing my share of sampling it! Dancing Trout Beer from Bayern! Enjoying hanging out with family, and enjoying the outdoors! Thanks for stopping by! Settling in...AND 4 months on the road! Friday was a delightful day of continuing to settle into our new digs for the next month. In addition I spent time at the computer in the coach taking care of some insurance clients' needs....in fact I spent several hours doing that! Probably the most time in one day I have spent on this odyssey "working". I continued to empty the trailer of rolling stock.......the only bike still inside is my mountain bike, which will get moved today, after I take it for a ride. I meant to ride it yesterday, but the insurance work kind of chewed up the time I had set aside to ride. However, around 1pm my sister came out and suggested she, Elaine and I take a short bike ride. Hilary, my sister, has a little 7 mile loop she does periodically, and it was a nice ride.....a little shorter than Elaine and I do, but it was fun to ride and chat, and see another part of "South Hill" where they live. 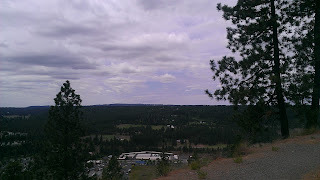 South Hill is on the southwest side of Spokane. After we returned from our jaunt around the countryside I settled back in to the insurance work, and got most of it done.....I'll finish up Saturday. After a short nap I tackled another job that I created the day we arrived. As we were parking the coach in my sister's driveway the patio awning arm on the coach caught the corner of the rain gutter and tore it (not the awning, but the gutter). The awning was unscathed, but the rain gutter needed some straightening and repair. Apparently, I found out later, I was not the first to hit the gutter. Anyway, a few rivets later the gutter is functional again, although a little worse for wear. I added a little caulking to be sure it doesn't leak. Later that evening we sat in the window seat area of their large dinning room enjoying the passing clouds, talking, and drinking a little wine while strains of Sinatra's "The Summer Wind" floated around us. We retired to the dinner table a little later for some meatball soup, and more conversation. I drifted down stairs eventually to see the end of the Celtic/Heat NBA playoff game....the Celtics won by 10 to pull within a game of the Heat...they are now down 1-2 in the best of seven series to determine who goes to the finals. It's nice not having to anguish over the Lakers this time of year (again), but I really hope they get back to the finals next year. I enjoyed the day, and am looking forward to a little more activity today (Saturday), although it is looking like rain most of the day.....maybe it's time for a long hike in the rain.....we did that last October when we were here, and I really enjoyed it. As you will recall I used a new 'Droid Blogger application on part of the last blog entry as an experiment, and am still getting used to using it to update this blog. It has potential, and I will give it another try in the next few days. Well, that's it for now......I didn't take any pictures of me at the computer yesterday, which is where I spent most of the day, so you just get to read today, and use your imagination! P.S. - Just realized that Thursday, May 31st, marked the end of 4 months on the road! WooHoo!!! !